MILIVOJEVIC, Z. N. , MILIVOJEVIC, M. , BRODIC, D.
When people that live at the small altitudes (up to 400 m above the sea level) climb on the mountain, they are exposed to the effects of an acute hypoxia. As a consequence, theirs oxygen concentration decreases in the tissue. This paper presents the analysis of the acute hypoxia effects to the speech signal at the altitudes up to 2600 m above the sea level. For the experiment, the articulation of vowels (A, E, I, O, U) from the test group of persons was recorded at different altitudes, which creates the speech signal database. The speech signal from database is processed by the original algorithm. As the results, the fundamental frequency and the energy of dissonant intervals of speech signal are obtained. Furthermore, the acute hypoxia effect to the energy distribution in the dissonant intervals of the speech signal is analyzed. At the end, the comparative analysis of the acute hypoxia effects shows that the level of the hypoxia can be determined by the change of the fundamental frequency and the energy of the dissonant intervals of speech signal. Hence, it is possible to bring conclusions about the degree of hypoxia, which in many situations can be of importance for avoiding catastrophic consequences. V. Liere, J. Edward, J. Clifford, Hypoxia. The University of Chicago and London, 1963. J. Obrenovic, "Fundamental frequency of the voice in relation to hypoxia as a stressor," Facta Universitatis, Series: Philosophy, Sociology and Psyhology, Vol. 2, No. 9, pp. 683-689, 2002. 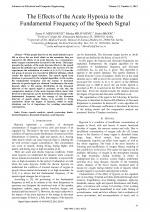 J. Obrenovic, M. Nesic, Cogntive values of speech signal under the conditions of acute hypoxia, Psihologiya, University of Nis, Vol. 2, No. 2, pp. 127-137, 2003. Z. Milivojevic, D. Balaneskovic, "Enhancement Of The Perceptive Quality Of The Noisy Speech Signal By Using Of DFF-FBC Algorithm", Facta Universitatis, Ser. : Elec. Energ. Vol. 22, No. 3, pp. 379-392, December 2009. H. S. Pang, S. J. Baek, Sung K. M., "Improved Fundamental Frequency Estimation Using Parametric Cubic Convolution", IEICE Trans. Fundamentals, E83-A, pp. 2747-50, 2000. 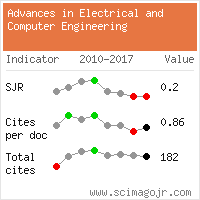 Citations for references updated on 2019-04-22 06:18 in 54 seconds. Website conception, design and maintenance by Eugen COCA. Content updated on 28 Feb 2019. Site engine updated on 28 Feb 2019. This page was generated on the server in 0.095 seconds and loaded in your browser in > seconds.